Here’s our last feature post prior to the release of the special VISIONS Across America issue, which should hit the mail in late March. Once that issue is in the hands of our Alumni Association members, I’ll post the stories featured in that issue so the blog will contain features on EVERY alum we met during this two-year project. Krista Eilers, MSW, NHP, QRP practices what she preaches. 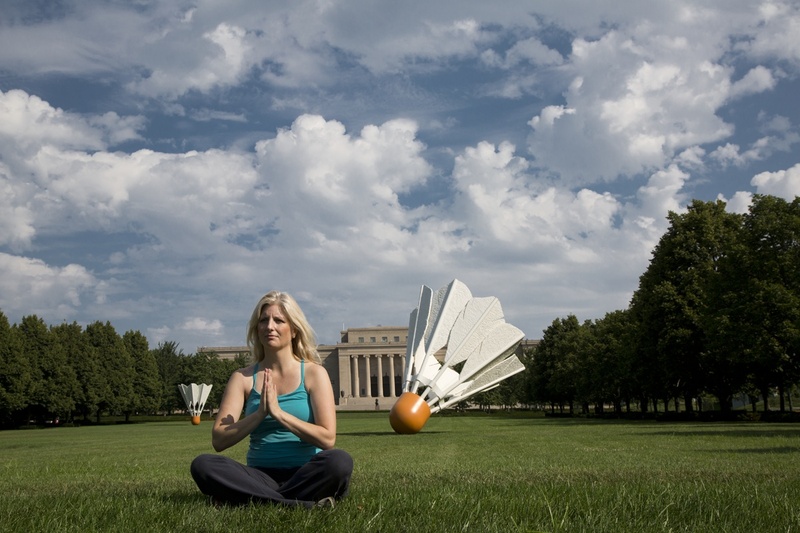 A holistic practitioner and founder of Holistic Healing in Kansas City, Krista starts each day with 30 minutes of yoga. When she’s not working as a yoga instructor or holistic health coach, Krista power-walks, bikes, and sails. In her professional life, Krista works with individuals in the areas of emotional health, cancer prevention, pain management, occupational health, stress and anger management, and nutrition. She also works with cancer survivors. “The number one most important thing in working with cancer survivors is emotional health,” she says. If she had to simplify her advice and “stick it on the fridge,” it would be this: Dietary changes (“eat fresh, wholesome food”), exercise (“especially outdoors!”), and meditation (deep breathing, yoga, tai chi, or whatever you enjoy). A native of Cedar Rapids, Iowa, and a 1993 ISU grad with a degree in social work, Krista has lived in the Kansas City area since 1994. Here’s our next-to-last feature post as we come down the home stretch on this project. We met Bill Findlay in Portland, Ore., last August. He and more than 100 other ISU alumni will be featured in the upcoming VISIONS Across America art exhibition in the Brunnier Art Museum April 3 – Aug. 9. Portland, Ore., has been very good to Bill. Those are Bill Findlay’s words, not mine. But after spending half a day in Portland with Bill (’66 architecture) as our tour guide, it’s obvious that the city has, indeed been good to him. And he’s been good for the city. Bill retired in April 2011 after first working as an architect for a dozen years and then working in the financial services industry for more than three decades. 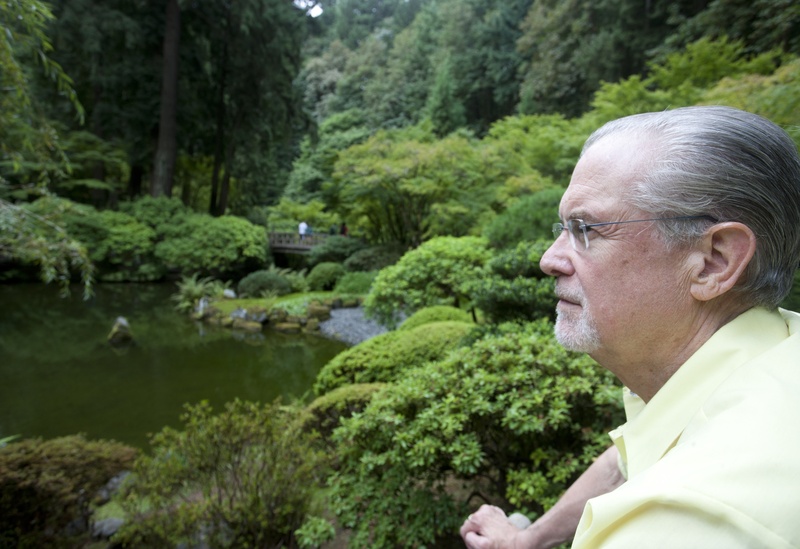 He’s spent 44 years as a board member or chairperson for Portland civic organizations including the Oregon Shakespeare Festival, Oregon Japanese Garden Foundation, Oregon Symphony, Portland Center for the Performing Arts, Oregon Art Museum, Portland Opera, and many others. His civic involvement began shortly after he moved to Portland when he became a member of the YMCA board. Bill isn’t complaining, though. He’s clearly proud of the volunteer work he’s done for the Portland Japanese Garden (“the No. 1 Japanese garden outside of Japan,” he says), the Portland Center for the Performing Arts, and the unique wheelchair-accessible Portland Rotary Rose Garden Children’s Park – all of which he showed Jim and me during our time together. He’s also a proud father to two grown children, John and Kathryn. Here’s another look back at warmer, greener times: Our September meeting with Dawn Refsell (’01 agronomy, MS ’03) in Lathrop, Mo. Dawn has two degrees from Iowa State – a 2001 bachelor of science in agronomy and a 2003 master’s in crop production & physiology – and a PhD in agronomy with an emphasis in weed ecology from Kansas State University. 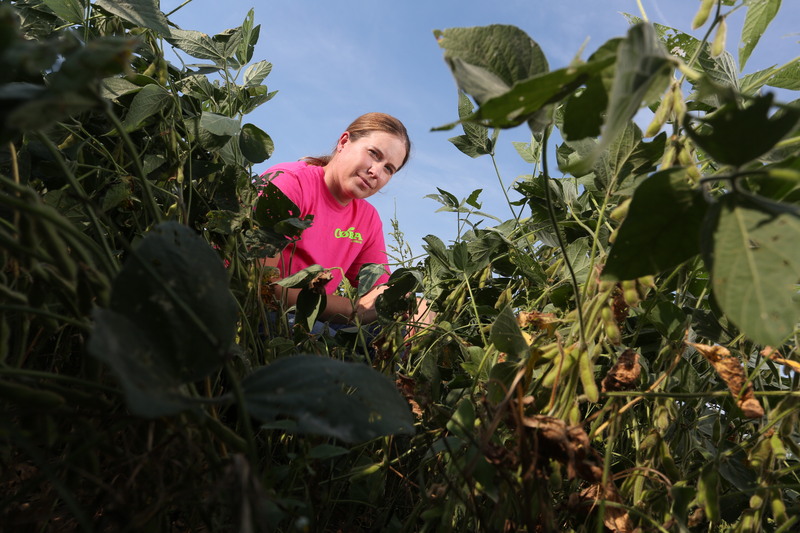 She’s a field market development specialist for Valent USA Corp.
It’s an interesting time to be a weed expert. Dawn lives with her husband, Doug, in Lathrop, Mo. Her field territory is Missouri, Kansas, and Iowa, but she travels throughout the country. Her focus is row crops and any of the products Valent sells for those crops. In early September, for example, she spent a week in Mississippi, working with a herbicide on cotton and peanut plants. But mostly, she says, she works out of her truck. Dawn grew up on a grain and livestock farm in Wallingford, Iowa (“a little speed-bump town.”) She was active in 4-H, and that connected her to Iowa State. All of her college roommates were 4-H friends. She was also a member of the second class of Hixson Scholars. One of Dawn’s specialties is waterhemp.